f. Minimum total GPA SSC/Equivalent and HSC/Equivalent 6.50.
h. Minimum Total SSC and HSC GPA 6.00. 2. 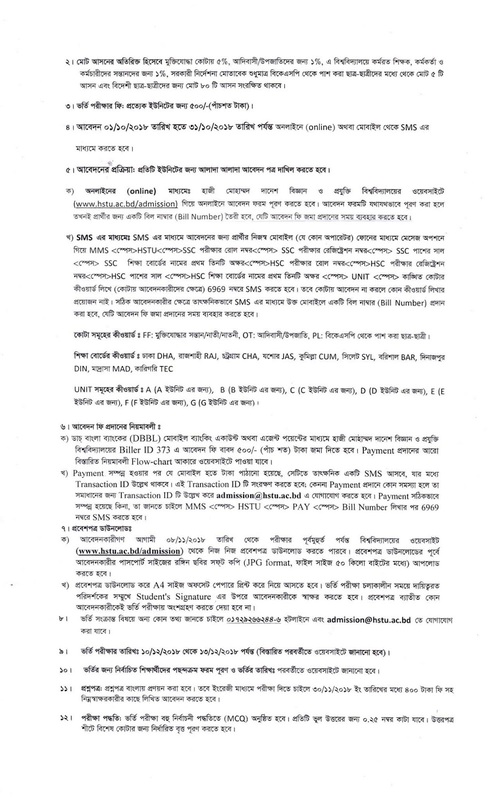 Visit: http://www.hstu.ac.bd/admission and fill up application form carefully. 3. Print the application form and note down the biller ID. 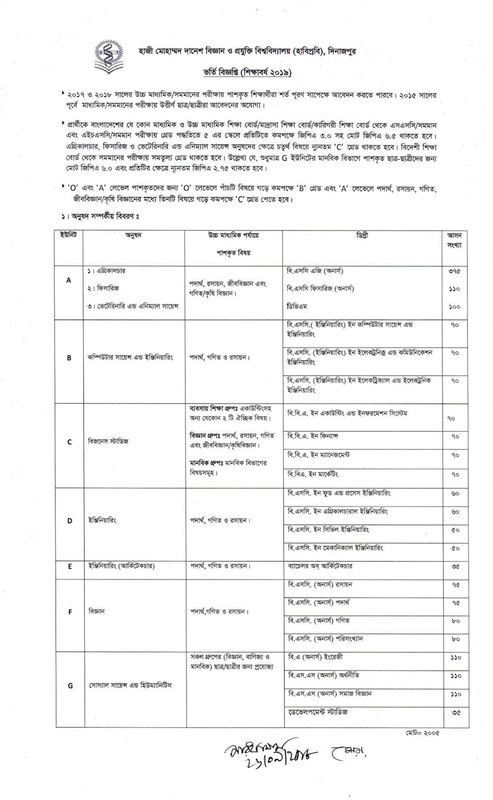 SMS System: Hajee Mohammad Danesh Science and Technology University (HSTU) SMS system below instruction. MMS <space> HSTU <space>SSC Roll <space> SSC Registration Number <space> SSC Passing Year <space> First Three Letter of Your Board Name <space> HSC Roll <space> HSC Registration Number <space> HSC Passing Year <space> First Three Letter of HSC Board Name <space> Unit <space> Quata Keyword (if applicable) and Send it to 6969. After return SMS get BILL Number to pay. Education Keword: Everyboard First 3 Letter. Example: DHAKA, DHA. 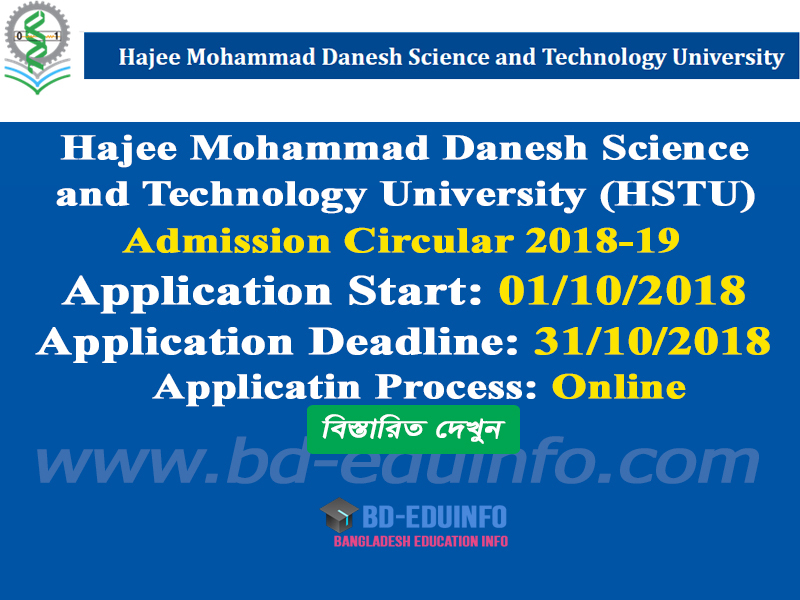 Selected applicant Hajee Mohammad Danesh Science and Technology University (HSTU) admit card can download 08/11/2018. a. Visit: http://www.hstu.ac.bd/admission admission and select the admit card menu. d. Uplaod a color photo (JPG format within 50KB). 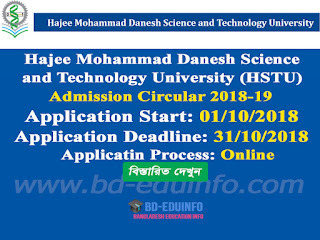 Tags: www hstu ac bd admission, bsmrau edu bd, Hajee Mohammad Danesh Science and Technology University (HSTU) Admission circular 2018-2019, BSMRAU Admission circular, BSMRAU Admit card download, BSMRAU seat plan, HSTU admisttion test mark distribuition, Hajee Mohammad Danesh Science and Technology University (HSTU) Admission circular, Hajee Mohammad Danesh Science and Technology University (HSTU) Admission test result 2018.
www hstu ac bd admission, bsmrau edu bd, Hajee Mohammad Danesh Science and Technology University (HSTU) Admission circular 2018-2019, BSMRAU Admission circular, BSMRAU Admit card download, BSMRAU seat plan, HSTU admisttion test mark distribuition, Hajee Mohammad Danesh Science and Technology University (HSTU) Admission circular, Hajee Mohammad Danesh Science and Technology University (HSTU) Admission test result 2018.